We have reviewed Flavors Cafe in the past and continue to go back, as time permits. It has actually turned into our favourite hang out spot! We have decided to briefly review them again after trying their crème brûlée. We have tried their regular crème brûlée, Darjeeling Tea Crème brûlée and Milo crème brûlée. Each time the dessert was expertly done and finger licking good (literally!). Crème brûlée has a custard base and a hard caramel top. The custard is smooth and mellow and the crunchy top layer is the perfect crush to this exquisite dessert. Best of all, it is light and good for sharing. It is priced very reasonably at about $3.00 and change. So if you are in the area, had dinner next door, or want a place for a great dessert, we would definitely recommend giving the crème brûlée at Flavors Cafe a try. 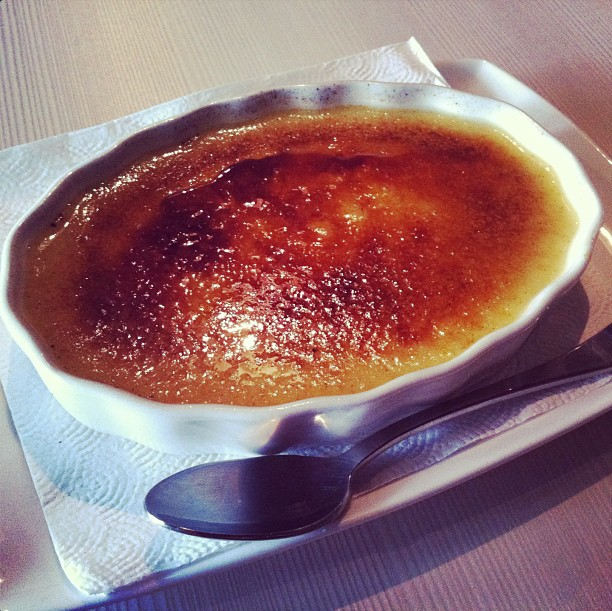 Categories: Restaurant Reviews | Tags: Crème brûlée, Custard, dessert, flavors cafe, Flavors Cafe Pickering, Halal, Halal Dessert, Halal Food, Pickering, Toronto | Permalink.